Security is one of the most important considerations for any eCommerce site. You need to protect your clients from phishing and other fraudulent activities that happen online. You can enhance website security by making use of the latest technology for your eCommerce development site. Magento has graduated from Magento 1 to Magento 2 and is giving users an opportunity to update their sites by 2020. Does remaining on Magento 1 pose any risk to your brand or website? Can you do anything to rectify such a situation? Security risks – attention will shift from Magento 1 to Magento 2 once it is abandoned in June 2020. This means that security updates will not be available leaving your platform exposed to cyber-attacks, raising the possibility of your website being hacked. This means that your customers and business will be at a high-security risk as opposed to when they migrate to Magento 2. Updating Modules – Developers will abandon the 1.0 platform. This means that updates will not be available. Your search for a Magento development company that works on 1.0 will yield no results because developers will be focusing on the new platform. This will cause the functionality of your website to deteriorate affecting how clients and visitors interact with your website. They will leave your store eventually for others that provide the best customer experience. Reduction In The Numbers of Magento 1 developers – increased uptake of Magento 2 means that most developers are looking to master Magento 2. Very few will be willing to take on a project that involves Magento 1. This leaves your business in trouble because you cannot access the technicians you need to enhance the performance of your platform. This would slow down your progress and affects revenue targets. Timeline Constraints during migration – completing the migration process can take several months, depending on the complexity of your business and clientele. By the time deadlines for migration arrive, you should have completed the migration process. Waiting until the last minute means that you will be rushing through the final stages. This affects the quality of the experience you provide to your clients. In case you lose them, they may never return. You have to consider the nature and size of your catalog to determine the ease and speed of migration. An ordinary store would require 3-7 months to migrate successfully. This is why quick action is required. Faster loading speed – Magento 2 is designed to load 50% faster than Magento 1. Visitors abandon slow sites. On the new platform, the speed of execution means that you keep all the clients who visit your site. Increase in volume – the latest platform is designed to handle more orders on daily basis. It also accommodates a higher volume of SKUs. This means that you can serve more clients and manage the traffic during peak hours. Mobile responsive – The Magento 2 eCommerce development platform allows you to provide your clients with a better mobile eCommerce experience. More people are making purchases and transactions through their mobile phones. You can attract more clients with an attractive and user-friendly design. Easy content creation and management – content is part of the customer experience you provide your clients. On Magento 2, you can create and manage content with ease. This means that customers will find it easier to locate the information they need. Managing your website will not be a difficult task either. Improved SEO and other search features – Magento 2 has been built with search engines in mind. Web spiders will find it easier to locate and crawl your website. This improves your ranking and exposure on search engines. This will boost your chances of having more clicks and customers. Easier checkout steps – buyers abandon carts because when they face a long and tedious checkout process. With Magento 2, security of both the card and customer information are guaranteed. This leaves you with reduced steps in the checkout process. As a result, there will be fewer or no incidences of cart abandonment. A more intuitive admin – your administrator can perform more tasks on the new Magento 2 platform. This gives them more control over transactions and the appearance of your website. An intuitive admin will also improve customer relations and thus enhance business. Vetting by Magento Team – Input of the Magento Quality Assurance Team would help improve the quality of your website. The Magento development company you hire would be able to add more features from those offered on the new platform. With the assistance of the quality assurance team, you will have an effective website that meets the expectations of your clients. Custom deployment on individual server environment – the aim is to make managing order easier. With a customized experience and enhanced security, customers will always return to your store. Other benefits include PCI certification and the ease of developing other solutions that are beyond Magento. Updating the technology you use is a part every major consideration that a brand should consider when enhancing their eCommerce development platform and its security. When you use out-dated systems, hackers have easier access to your website and greater access to compromise transactions with your clients. 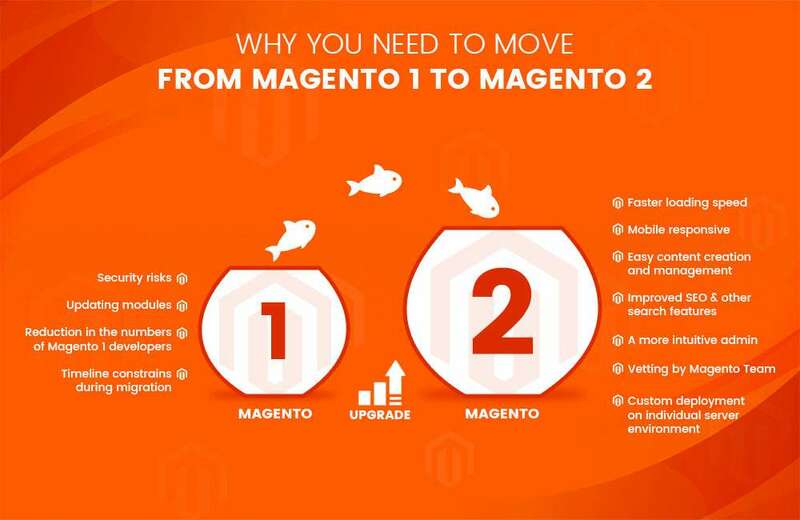 Strengthening your eCommerce business by migrating to the Magento 2 platform allows you to provide a better customer experience and added security.